I laughed, because no human being actually talks like that, right? Clearly, he was badly coached. Stilted words guaranteed a clumsy delivery. This turned into an awkward, laugh-out-loud moment. Later this afternoon, I worked with another service. “Customer service is our top priority,” the customer service person squawked at me, stiffly. I didn’t laugh this time. I felt alarmed. Twice in one day? Two different companies? What gives? When did training employees to talk like robots sneak back into fashion? 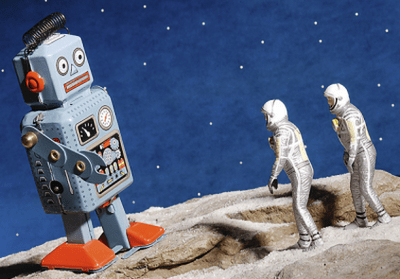 The rise of social media taught us that robotic corporate scripts do little to help customers connect to the brand. Instead of training employees to ‘speak to a script’ — it’s far superior to learn business improvisational skills. How might a customer react to a certain situation? How might an employee respond? How might an employee initiate a conversation? How might a customer respond? The answers to each set of questions are limitless. Limiting conversations to a small set of scripts dehumanizes the interaction. It’s a painful and humiliating experience for both the employee and the customer. Instead of scripting your business interactions, imagine a training session where employees present each other with a variety of customer-facing situations. Employees can practice responding to the many moods and scenarios they encounter on a daily basis. Employees learn and practice empathy skills when they act as customers in each scenario. Why would anyone ‘stick to the script’ when they can instead present an opportunity to make an authentic personal connection?